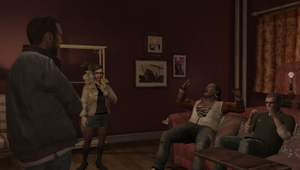 Mallorie Bardas introducing Niko Bellic to drug dealer Elizabeta Torres and Patrick McReary. This is the first mission given by Elizabeta Torres to watch over a drug deal. This the first time you meet Packie. This mission serves as a Sniper Rifle tutorial. Elizabeta asks Niko to keep watch over a deal she isn't too comfortable with. At some point after the mission, Niko receives three phone calls: Michelle and Little Jacob call to warn Niko about trusting Elizabeta, while Roman calls to remind Niko that he can watch television in the apartment. Once the mission completed tune plays, the player can easily shoot Packie without the mission failing, even destroying his car with an RPG. He will still show up later in the game. It is possible to kill Packie's associate during the shootout, however, this will not result into failing the mission and wont have any effect in the storyline. Patrick McReary calls Niko Bellic his "guardian angel", a reference to a mission of the same name in Grand Theft Auto: Vice City where Tommy Vercetti and Lance Vance watch over a drug deal between Ricardo Diaz and the Haitians. Patrick McReary explaining the situation to Niko Bellic. Niko Bellic watching Patrick McReary and the other drug dealers with a sniper rifle. This page was last modified on 24 September 2014, at 03:25.